WHAT KIND OF POPE IS THIS? 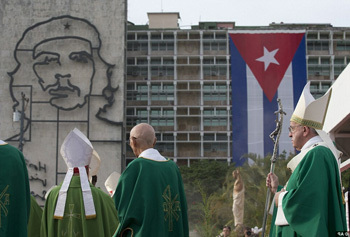 - With Francis’ departure from Philadelphia to Rome last Sunday, September 27, we were freed from the avalanche of news reports, TVs clips and YouTube videos reporting his visit to Cuba and the U.S. His Jerry Lewis style of being Pope made him very popular in America, homeland of Hollywood movies and Broadway shows. Here the appreciation for onstage artists goes so far as to elect film celebrities to become mayors of cities, governors of states or even presidents of the nation. 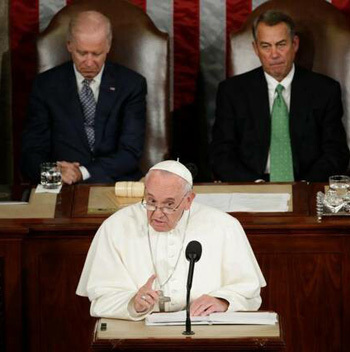 It is not surprising, then, that Pope Bergoglio, a man with such a large repertoire of phony facial expressions, would find a warm welcome in the United States. In order to accurately evaluate the success of his tour this last week, we should add to his thespian-comic skills the attraction normally caused by contradiction. To make myself clear, I offer my reader a recent example. Suor Cristina, the singer nun whose clip went viral around the entire world after she appeared in a rock talent-search show in Rome. That day she conquered the punk judges of the show and the viewing audience; soon her “success” would spread everywhere. Why? Is it because she has an extraordinary voice? I believe her voice is just a little better than average. Is it because she is beautiful and presents herself well? Not particularly so. Is it because she is very charming? I do not see anything like this in her. I believe that the objective answer is: She became famous because she displays the opposite of what people expect from a nun. Thus, to view a spouse of Jesus Christ who should be cloistered in a convent singing and dancing to crazy rock ‘n roll onstage; to see one who dedicated herself to a life of virginity publicly embracing men and women of bad moral reputation; to watch a nun whose only love should be her celestial Groom paying homage with finger signs to Satan, the great adversary of Christ – it is this series of contradictions that attracts people. Something analogous happens with Francis. As a Pope, he is the highest authority on earth, but he publicly rejects the seriousness and ceremony of his position. He is the representative of 2,000 years of Catholic Tradition, but he steps on every possible element of that Tradition to please the egalitarian spirit of our century. He is the natural center of Catholic orthodoxy pursuant to the limits of papal infallibility, but he preaches the opposite of what the Church always taught. 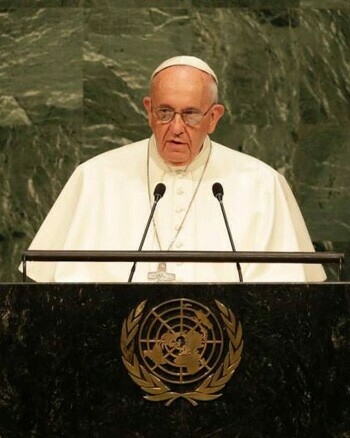 He is the supreme standard of morality on earth – when someone wants to know what is good or bad his eyes normally turn to the Pope – but he is the greatest promoter of a moral-free life. He is charged with confirming his spiritual brothers and children in the Faith, but he weakens the Faith in all Catholics by his example and words. He is called to spread the Gospel of Jesus Christ throughout the world, but he promotes all the false religions. In short, he is the Vicar of Christ on earth, but by hiding Jesus Christ when he stands before Jews, Freemasons and pagans, he acts as an Antichrist. This ensemble of contradictions, in my opinion, is the key to Francis' “success.” Heretics, communists, masons, schismatics, free-lovers, prostitutes, homosexuals – all children of darkness applaud him because his teachings “justify” their actions. These are some of the highlights of the extreme leftist accomplishments of “our wonderful Pope” made in a single week. Is Suor Cristina Giving a Masonic Handshake?